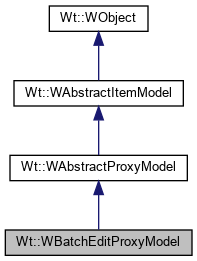 A proxy model for Wt's item models that provides batch editing. This proxy model presents data from a source model, and caches any editing operation without affecting the underlying source model, until commitAll() or revertAll() is called. In this way, you can commit all the editing in batch to the underlying source model, only when the user confirms the changes. The model supports both simple tabular models, as well as hierarchical (tree-like / treetable-like) models, with children under items in the first column. Default values for a newly inserted row can be set using setNewRowData() and flags for its items using setNewRowFlags(). This commits all changes to the source model. Returns whether changes have not yet been committed. Returns whether have been made to the proxy model, which could be committed using commitAll() or reverted using revertAll(). The default implementation will copy Wt::EditRole data to Wt::DisplayRole. You may want to specialize the model to provide a more specialized editing behaviour. Configures data used to indicate a modified item. This sets data for item data role role to be returned by data() for an item that is dirty (e.g. because it belongs to a newly inserted row/column, or because new data has been set for it. When role is Wt::StyleClassRole, the style class is appended to any style already returned by the source model or set by setNewRowData(). By default there is no dirty indication. Sets default data for a newly inserted row. You can use this method to initialize data for a newly inserted row. Sets the item flags for items in a newly inserted row. By default, flags() will return ItemIsSelectable. All signals of the source model are propagated to the proxy model.